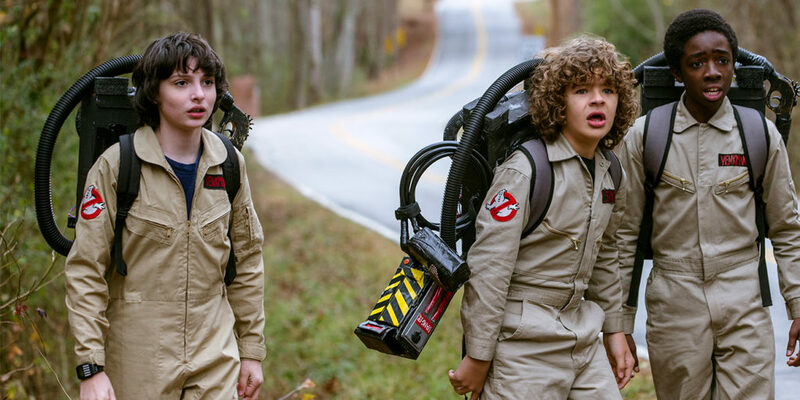 Stranger Things creators The Duffer Brothers needed approval from Ghostbusters director Ivan Reitman and star/co-writer Dan Aykroyd to feature the movie’s costumes this season. The wait for the second season of Stranger Things—or Stranger Things 2, as Netflix is calling it—is finally over. The streaming service dropped the nine-episode Season 2 this morning. Two things are quickly apparent about the second season: it’s a worthy followup to last year’s debut, which was one of 2016’s best new shows, with a mix of ‘80s nostalgia, scares and fun that proves Season 1 was no fluke. Also, creators The Duffer Brothers have included even more brands this time around, spotlighting everything from 3 Musketeers to KFC (or Kentucky Fried Chicken, as it was then known). While Netflix partnered with several brands to market Stranger Things 2—including Lyft (which is offering rides in “Strange Mode” this weekend to users in Philadelphia and Los Angeles), Snapchat and Eggo—a Netflix spokesperson told Adweek that no brands paid for integrations in Season 2, and none of its marketing partnerships extended into production. But at least one of the brands was aware of its inclusion ahead of time: Ross and Matt Duffer told Entertainment Weekly that they needed Ghostbusters director Ivan Reitman and the film’s star and co-writer Dan Aykroyd to approve the use of the movie’s costumes in the show. A new character, Keith, works at the local arcade, and can’t stop stuffing his face with Cheetos puffs. Speaking of the arcade, the quartet of boys—Mike (Finn Wolfhard), Will (Noah Schnapp), Dustin (Gaten Matarazzo), and Lucas (Caleb McLaughlin)—and new character Max (Sadie Sink) visit it frequently. Among their favorite games is Atari’s Dig Dug, which is also the name of Stranger Things 2’s fifth episode (or “chapter,” as the show prefers to call it). Several other famous games can also be glimpsed in the arcade, including Pac-Man, Galaga and Dragon’s Lair. The favorite food of Eleven (Emmy nominee Millie Bobby Brown) makes a reappearance—okay, several reappearances—in Season 2. The 1984 supernatural comedy hit came out three months before the events of the second season, so it’s no surprise that boys would dress up as Ghostbusters for Halloween. The movie’s theme song also makes an appearance. One of the brand’s early camcorders is used throughout the season. Several other electronics brands appear during the season, including Panasonic and RCA. The fast-food chain receives a big spotlight in the first episode, popping up at a dinner between four characters. Steve Harrington (Joe Keery), even refers to its famous slogan, noting, “This is finger lickin’ good!” But he also says, in a likely anachronism, “I love KFC.” The brand didn’t change its name from Kentucky Fried Chicken to KFC until 1991, a move the company now regrets. Several characters—not just the one you would expect—are seen pouring the syrup on waffles and other food items during the season. Eleven comes across a TV ad for Oreo, which notes, “They’re perfect for dunking!” as the cookie is dipped into a glass of milk. Several camera brands pop up during the season—including Kodak Instamatic and Pentax—but none more frequently than Polaroid, which is used to document both happy and less-than-happy occasions. Sean Astin’s character Bob, boyfriend to Winona Ryder’s Joyce, works at the now-defunct electronics chain, and puts his technical expertise to use.